The holiday camping site of Sant Miquel offers a truly traditional Catalan flavour for those who are looking to escape the throngs of tourists found at major luxury camping locations. Those who are interested to learn more should contact LUX-camp at their convenience. A pristine environment set within vineyards and olive groves. 220 different pitches to accommodate on-site mobile homes. Dogs are welcome during any time of the year. Sant Miquel is located within a quaint and traditional Catalan village. So, those who have been hoping to appreciate this unique culture cannot go wrong when choosing this luxury camping site. Not only are olive groves and wineries located close by, but art enthusiasts can experience the many local museums which are dedicated to Antonio Gaudi; a Catalan himself. All of these attractions are located only a stone's throw away from the centre of this holiday camping site. Modern camping should always meet the unique requirements of the guests themselves. Nothing has been left to chance in terms of camping in luxury when visiting Sant Miquel. Wireless Internet can be accessed by all visitors and there are security lockers for those who wish to store any valuable items while venturing out and about. 46 washing cubicles help to ensure the highest levels of sanitation and baby changing rooms are provided for those who plan on arriving to this luxury camping resort with children. Although there is a plethora of activities to experience within the luxury camping site itself, it needs to be mentioned that other attractions are located only a stone's throw away. 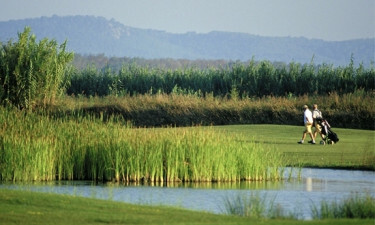 Bicycle hire, boat rentals, horseback riding and angling are but a few examples. Miniature golf and tennis are some other leisure opportunities not to be missed and these can be accessed within only minute from the site. 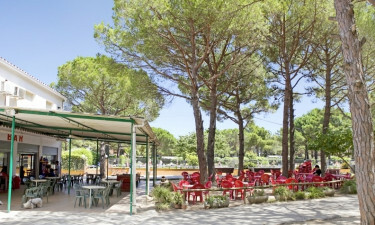 One of the other benefits of selecting Sant Miquel for an upcoming camping holiday involves the convenience of on-site eateries and bars. This sense of camping in luxury is enhanced thanks to venues that are able to cater to both local and international tastes. Their snack bar will serve up a tasty cocktail or two while some takeaway establishments offer daily menus at unbeatable prices. 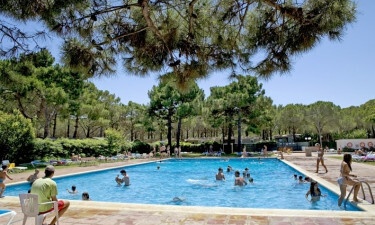 The professionals at Sant Miquel appreciate the fact that any camping holiday can be enhanced with the presence of supermarkets and other facilities that offer daily provisions. Visitors can purchase fresh produce, meats and other everyday essentials. There is also bakery that supplies freshly baked bread and pastries on a daily basis; perfect for a tasty breakfast. Anyone who wishes to experience a traditional Catalan environment while enjoying an unforgettable luxury camping site should contact a LUX-camp representative to obtain further details.